Dat vote tally tho. Go home Flath, you're drunk. Nah, you guys need to participate and vote! I have been trying to talk to the people I have seen connected on Steam all day long. I will continue doing so, despite being busier tomorrow. These are some things I would like to mention on the first post. I'm inclined to believe Majin is town. Let's imagine for a second he is mafia with Numble. So there's two possibilities: Majin remembers the existence of the soothsayer or he doesn't. If he remembers, it's a bit risky to vote for a fellow mafia. And if he does not remember, it's likely for at least one mafia member to remember, so they will talk to Majin telling him not to vote that person. This is why I believe Majin is town. 18:51 - Dee Dee: youuuuuuu! won't you post? i've seen you check the thread! 18:51 - SwedeDatDatBigStiffy: i was gonna post just before i go to bed. And turns out you forgot. [vote SweedyGonzales] I want to hear your thoughts on the game. This is not my final vote. I'm still waiting for your thoughts so far. I tried to talk to you earlier, but since you were busy, I hope you have some minutes to reply either here or on steam. 14:59 - Dee Dee: so what are your thoughts so far? 15:00 - Dee Dee: any theories of your own? Besides, Rawrrz, I would like it if you give it a thought and shared some ideas with us, because we have nothing except that one vote from you. I'm still waiting for a confirmation of that reason from Larah and something useful from Larah, Rawr and Sweedy. All this people saying you are going to post later (for whatever reason) just post. The only thing we can do as a village is talk and lynch and a silent town is not helping us in any way. 2. Maki - Just replies when confronted. 3. Larah - Is busy with exams, but seems a bit bored/lazy to post in general. Could be town. 5. Ultor - He might be town. 6. Hater - Likely town, Numble did not hesitate to contribute to the bandwagon. I would like to see more posts from you. 7. Patrick - Been trying to read his reactions over Skype / Discord. The only thing I would mention is that when I told him I suspected Numble (because of the 3rd vote on somebody) and then the second votes (Maki, Rawr, Patrick) he just told me that suspecting half of the town is not useful at all. 8. Sweedy - He seems to be afk, but I do see him check the thread every now and then. He says he will post then forgets, then just doesn't. 9. L.A.P.D - Does he even know what he is doing? 10. 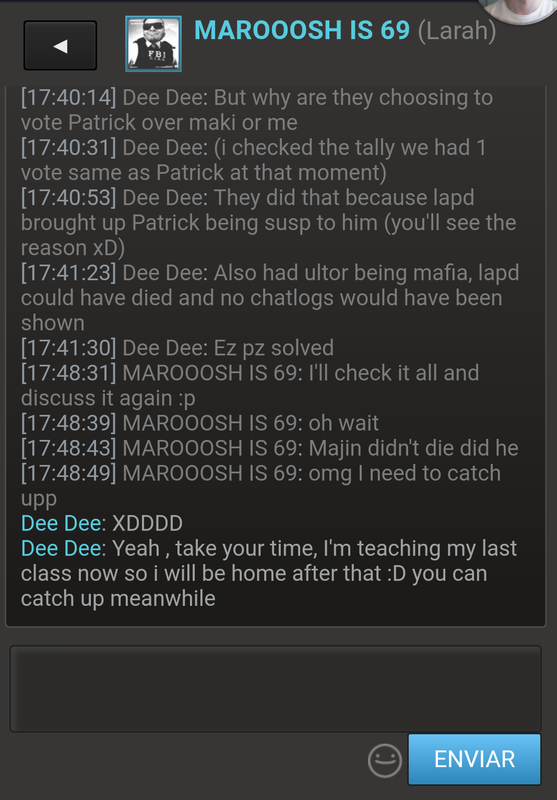 H2O - If H2O flips mafia, Patrick is town and viceversa. Only for the scenarios of one of them being mafia. Also, don't wait to post. Last note, just in case, village power roles DO NOT CLAIM to anyone and DO NOT CLAIM in public. How convenient, if I am not the soothsayer, I am getting lynched. What if we leave it this way? If I die, Majin is confirmed. If I don't die, I am confirmed. Also, I talked to L.A.P.D. Everything's fine! So LAPD claimed not to be a village because he thought he had all the modifiers. That's what he said to me when I did not know about this conversation and I told him either Majin or me are the soothsayer. @Hater and @LAPD I want an explanation from the ss and the convo vs. the logs posted by Ultor. If I die H2O, Majin and Sweedy work together! Bot of them were after 3AM hello? Read Lawliet's previous post. He says the round ENDS in 3h27' from 00h33' (the time I have in forums). So those posts should be counted. I'd love to see a post from you with a list containing your thoughts about each of the remaining people. I really want Maki to post, he is the only one left to share his thoughts. Rawrrz, keep reading the thread please! I'm recommending a lynch & brutal on Maki and Larah. Why is she saying "Majin didn't die did he" out of the blue, when Majin was NEVER targetted in this thread? So, let's lynch Larah and use the Brutal on Maki. So, why not lynch Ultor? Everybody in this game has agreed to lynch him at some point of the game. EVERYBODY. Nobody has defended him. If you argue that L.A.P.D did, L.A.P.D also tried to have him lynch on the previous round. If you guys check the conversation logs he shared with us, you will see that L.A.P.D did claim not to be a villager and had Ultor been mafia, we would have never seen these screenshots, since L.A.P.D would have died. The rest of Ultor's posts are just Ultor being Ultor. I'm pretty sure at this point that Hater and Ultor are both stubborn town focusing on one another. 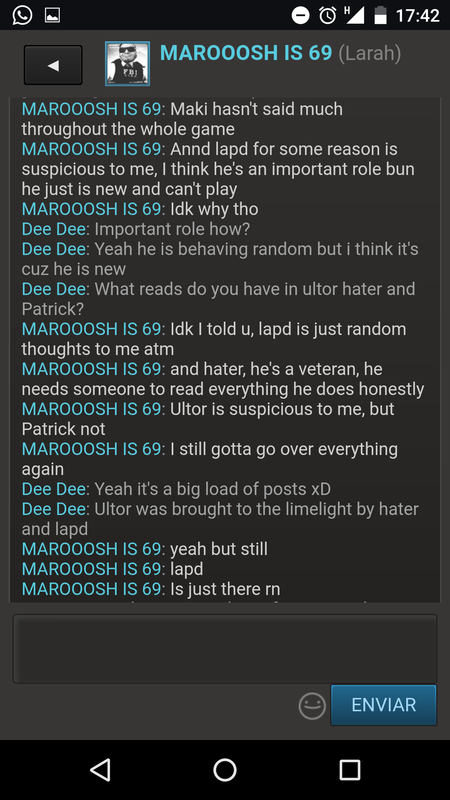 The proof Hater provided was given to him by L.A.P.D who one round said Ultor is clear and the next day Ultor is apparently mafia when nothing happened AND DESPITE the logs. 1. Majin: The chance of him being mafia is remote. Mafia really needs to be stupid to risk a lynch in the most OP role they have (surgeon) and, as it has been stated before, I'm sure somebody in the team would have noticed it if by any chance Majin didn't. : Larah: No clue because she hasn't contributed at lot(Like me). Can't make any assumptions at this point. Sweedy: He's claimed to be the doc and no one has counter-claimed him at this point so it's same to assume he IS the doctor, so I he's fine. There's a good chance he may be mafia due to how weird he's being but since he's new and it's lapd I have no clue. However, the screenshots of him speaking to Ultor kind of make me believe that he's not mafia! Patrick: He hasn't really done anything major currently that would either warrant him suspicious or a townie, so I'm not really sure about him! HATER: Looking at firstly Numbles vote on hater it looked as if he was finding a scapegoat, and I really don't think he'd be careless enough to vote a fellow mafia. He's also put up a lot of valid arguements on Ultor being mafia which further makes me believe that he's town! Ultor: Oh boy. I'd personally say he's mafia due to the screenshots from LAPD where he was saying he'd shoot him(Vig was H2O) and "i really think numble is innocent". I feel like them two alone is enough to make him a big suspect as it can't be a coincidence that he'd make both those claims. He still hasn't explained his reasoning either he also said that he'd rather not vote NUMBLE even though his own life was at risk(<- sounds super dramatic). He also further went to claim that HATER was mafia without any evidence nor reasoning, so I think he's maifa. Maki: He's staying really quiet, which I find weird. I can't really think of anything to say about him due to how little he contributed! Can't make a thesis about him. 20:48 - SwedeDatDatBigStiffy: what do you think of majin? you said i should work with them were you to die, but they haven't done much. 3. Hater: Most likely town. Numble was the one kinda making the bandwagon on him. 4. Ultor: Most likely town for the reasons already mentioned. Suspects: Larah & Hater mostly because of the screenshots. I explained to him it was L.A.P.D who manipulated those. 13:15 - Dee Dee: but why did you guys choose patrick over me or maki? 13:16 - L.A.P.D: All he does is "admining"
13:16 - Dee Dee: you mean patrick? 8. Patrick: Don't forget he is in no way confirmed. @Rawrrz -> If Ultor is getting lynch despite my post, shoot Larah. This is the order of actions. I'm going to die tonight. So use my post and if you want to talk, do it today. RAWRRZ, use brutal in LARAH. If she is Mafia some people will try to delay the vote tally outcome, so get Larah please.